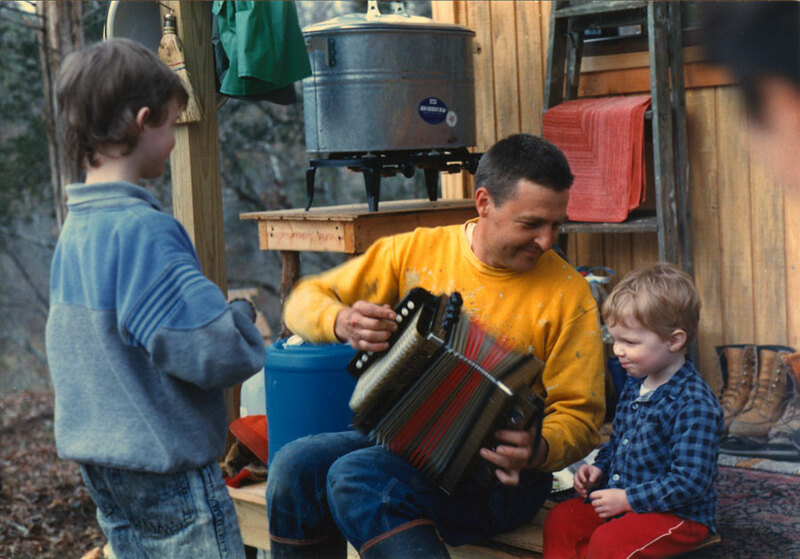 Benson playing a Hohner button accordion for a young visitor. The galvanized wash boiler setting on the wooden table behind Benson was used to heat water for washing dishes and taking showers. The outdoor shower system consisted of a 2.5-gallon jug hanging from a tree branch. The jug was fitted with a ball valve, short hose extension, and shower nozzle. 1989, scanned color print, 3 x 5 in. (7.62 x 12.7 cm). Ozark Series. © 2008 by Allen C. Benson.